In November 2017 experts of the company Trimetari Consulting LLC completed the work on ground laser scanning and BIM-modeling of the train shed of the Yuzhnyi Railway Station in Kaliningrad City, Russia. 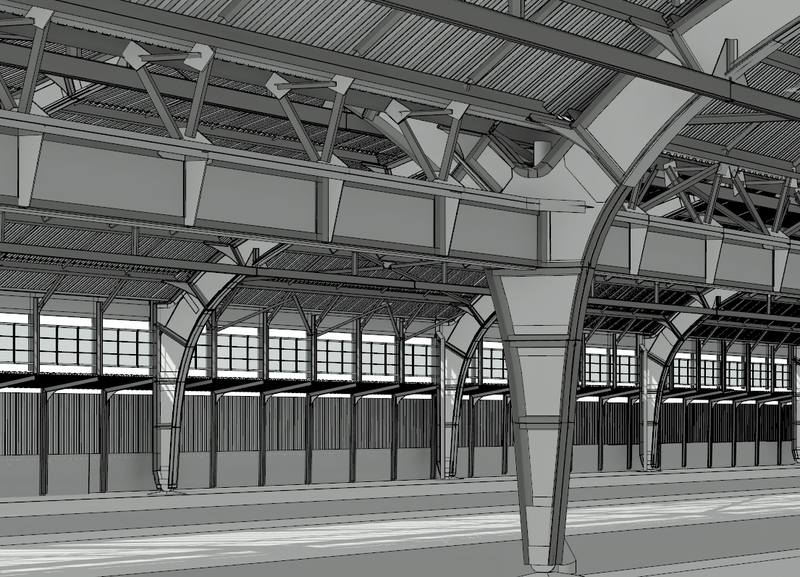 The train shed of the station is a steel frame structure with dimensions of 176 x 118 m and a height of 15.5 m. Based on the results of laser scanning, a BIM model was created in the Autodesk Revit software package. The 3D model includes the main and auxiliary structural elements: supporting columns, arches, lantern farms, beams and cover runs, vertical and horizontal links, roofing, stained glass systems – the whole model holds more than 27,000 elements. The presence of a 3D model based on laser scanning data made it possible to reveal the unreliability of the initial data in the topographical plan, and unknown before that time the deformations in the construction of the train shed. The model was used to design the reconstruction of steel structures of the train shed, engineering calculations, calculation of the amount of material necessary for work. Laser scanning showed an incredible speed of obtaining the original data with a high degree of detail. Learn more about the project.